Place Denfert-Rochereau, previously known as Place d'Enfer, is a public square located in the 14th arrondissement of Paris, France, in the Montparnasse district, at the intersection of the boulevards Raspail, Arago, and Saint-Jacques, and the avenues René Coty, Général Leclerc, and Denfert-Rochereau [fr], as well as the streets Froidevaux, Victor-Considérant and de Grancey. It is one of the largest and most important squares on the left bank of the Seine. The square is named after Pierre Denfert-Rochereau, the French commander who organized the defense at the siege of Belfort during the Franco-Prussian War (1870–1871). It is dominated by the Lion of Belfort statue (a smaller version of the original in the town of Belfort) by Frédéric Bartholdi. The square is the location of the Paris Catacombs museum. It is frequently the place where demonstrations and protest marches in Paris either start or end. The square is also the place depicted on the backdrop at the beginning of the third act of La Bohème by Puccini. "How did those children come there? Perhaps they had escaped from some guardhouse which stood ajar; perhaps in the vicinity, at the barrière d'Enfer, or on the esplanade de l'Observatoire, or in the neighboring carrefour, dominated by the pediment on which could be read: invenerunt parvulum pannis involutum ["they discovered the infant wrapped in swaddling clothes"], there was some mountebank's booth from which they had fled […]." Here, astride the opening in the wall, the architect Claude Nicolas Ledoux constructed two tollhouses to be used for the collection of the octroi, a local tariff levied on products entering Paris. At the center of the present square, these two pavilions once framed the opening in the wall, and now, oddly, the entrance to the underworld of the catacombs lies next to the western one of them, the pavilion at the barrière d'Enfer ("barrier of Hell"). Denfert-Rochereau was a courageous man and an authentic hero, but whether his grandiose nickname, "The Lion of Belfort", was deserved is a matter of some debate. Nonetheless, since "Denfert" (of Denfert-Rochereau) is pronounced exactly the same as "d'Enfer" (of Place d'Enfer), this coincidence was too perfect for the mairie (city hall) to ignore. They renamed the square Place Denfert-Rochereau, and they could plausibly deny that they were ignoring Paris's ancient traditions in so doing. The name has remained Place Denfert-Rochereau ever since. The main square, Place Denfert-Rochereau, is planted with trees, mostly horse chestnuts, maples, and locusts, and there are three named green spaces within it as well: Square Abbé Migne, Square Jacques Antoine, and Square Claude Nicolas Ledoux. At the center of the square, in the midst of the traffic circulation, is a one-third-scale replica of the Lion of Belfort statue by Bartholdi, symbolizing the courage of the resistance raised by Colonel Denfert-Rochereau at Belfort. In the garden to one side is a monument by Jean Boucher commemorating Ludovic Trarieux. The tax-collection pavilion of the Enfer barrier. The entrance to the catacombs is behind the double-gate on the left. The entrance to the Paris Catacombs is located next to a handsome stone building with three romanesque arches across its facade, on the odd-numbered side of Avenue du Colonel-Henri-Rol-Tanguy (a street, one block in length, that hardly qualifies as an avenue.) This entrance is directly across the street from an identical even-numbered building that houses the Directorate of Roads and Transport (Direction de la Voirie et des Déplacements). These two buildings, classified as historical monuments, are the pavilions of the old Barrière d'Enfer, where taxes were collected on goods entering Paris. They are built to the design of the 19th-century architect, Claude Nicolas Ledoux, whose work can be found all over the city. This part of the square has enveloped the site of the Barrière d'Enfer, as well as part of the boulevards d'Enfer and Saint-Jacques, and a part of the boulevards Montrouge and Arcueil, roads which, at one time, led to those two southern suburbs but no longer exist. The Place Denfert-Rochereau is served by lines 4 and 6 of the Paris Metro, from Denfert-Rochereau station. It is also served by the RER Line B commuter train from the old railway station of the Sceaux line, the entrance to which is to the east of the square. The Place is the Paris terminus of Orlybus, the RATP shuttle bus service between the city and Orly Airport. This article was translated from the corresponding material in the French Wikipedia. 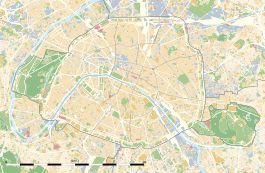 Wikimedia Commons has media related to Place Denfert-Rochereau (Paris). This page was last edited on 28 November 2018, at 14:29 (UTC).